Like many, BrainLazy got our first look at Joe Danger back at the inaugural PAX East, where Hello Games had a booth. It had engaging gameplay, but we weren’t lucky enough to get our hands on a review copy until this, the Special Edition, was released. Now we finally get to sink our teeth into this entertaining little mash-up of half a dozen different genres. Who is driving? Oh my god monkey is driving, how can this be? Joe Danger has a highly distinctive visual style. The characters and environments are very smooth and cartoon-like. Joe himself reminds me of a more confident and competent Leisure Suit Larry, for some reason, while his surroundings are reminiscent of the Mushroom Kingdom, with large, colorful blocks with smiling faces, anthropomorphic moles, and things of that nature. Everything has a very upbeat personality to it, even the angry little bombs and mysterious stomping totems. Different levels spice things up a bit. 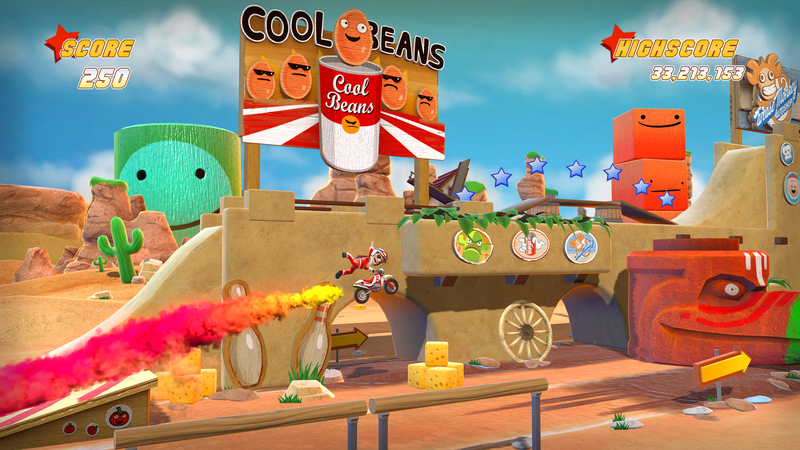 Though you’ll spend most of your time on a very excite bike-style motorcycle track, you will run through old west and even laboratory settings, depending on what point in the game or mode you are playing. 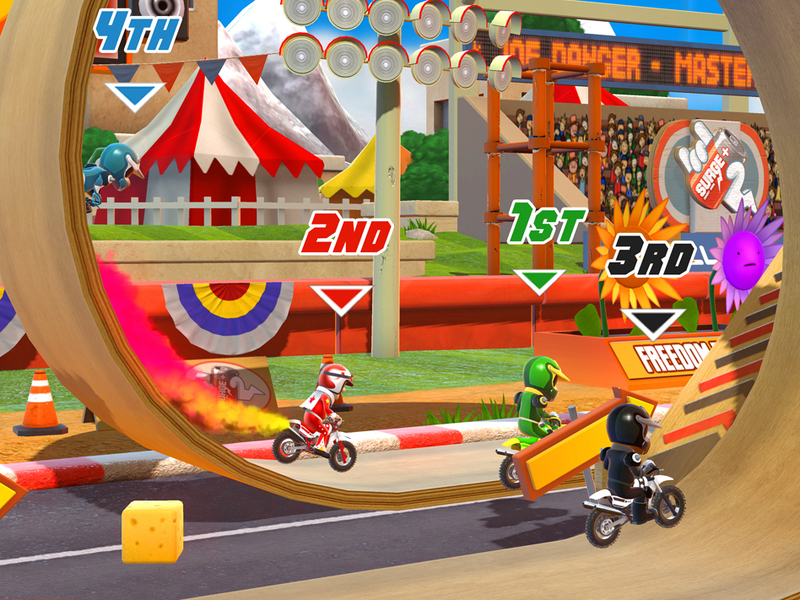 Aside from your main character’s Knievel-inspired outfit, you’ll have various different “costumes” unlocked as you progress, each of which affects more than just the person sitting behind the handlebars. Choosing the chimp, for instance, changes the collectibles from stars into bananas. The loop might be fun, but it won't win you the race, that's for sure. Joe Danger is one of those games you can describe via an equation, but the longer I play it, the more complex that equation gets. At first glance I thought, “Oh, it is a new Excite Bike,” and there is certainly that aspect to it. You are riding a motorcycle on a multi-lane raceway scattered with ramps and hazards, you can control your speed with a limited boost ability, and you can control the bike’s angle. You can even edit the obstacles on a level to create your own board. Then I played for a bit and I realized there was a bit more to it. The obstacles were tricky and over the top, and if you wiped out, you had to go back to an earlier checkpoint, and the physics are a bit more complex than simple Excite Bike style physics. “It is Excite Bike + Trials HD,” I decided. Then I started paying attention to the point system. 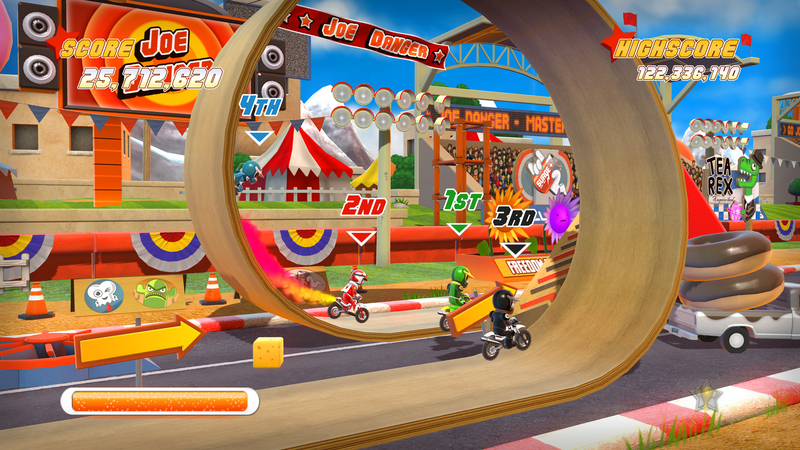 Aside from wheelies, endos (stoppies), and flips, you can tap the bumpers in various combinations to do tricks. Each new trick in adds points to your running score and ups your multiplier. Not only that, but you can keep a wheelie going between jumps to maintain the combo, just like the manual in Tony Hawk. The boost, for that matter, is refilled by doing tricks, like a special meter. “Okay, it is Excite Bike + Trials HD + Tony Hawk.” Then I noticed the collectibles, which are scattered through the level, and the loops and pinball bouncers, and the far greater than average air-control. “Right, Excite Bike + Trials HD + Tony Hawk. + Sonic The Hedgehog.” Oh, and sometimes you hit an item that makes coins appear that you have a limited time to collect, and certain levels have one or more hidden collectibles. “Excite Bike + Trials HD + Tony Hawk + Sonic The Hedgehog + Super Mario.” Oh, in those races, you can punch other racers off their bikes. Excite Bike + Trials HD + Tony Hawk + Sonic the Hedgehog + Super Mario + Road Rash.” You get the idea. Really, there comes a point when, if you need to add that many different classic games together to get this one, you just have to draw the line and call it its own game, which Joe Danger absolutely deserves. Every gameplay mechanic that is borrowed from or inspired by something else is explored and played with in great detail. There are some levels that require you to enter the sandbox mode and adjust ramps before you can complete them, adding a puzzle component. 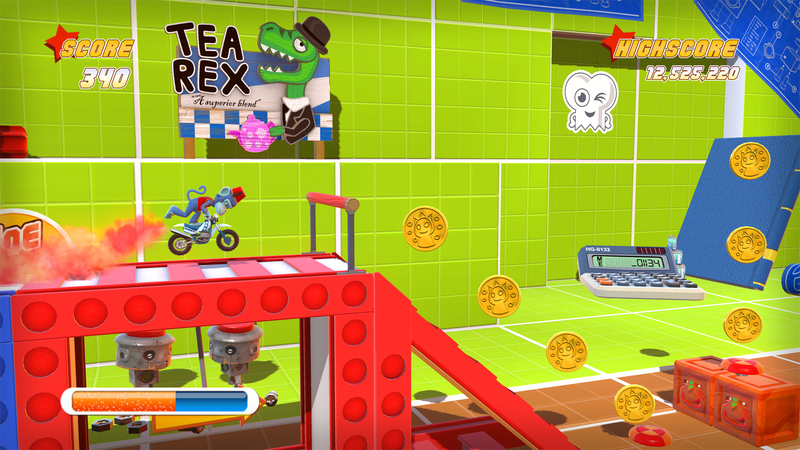 Various levels have any number of different goals, such as collecting all collectibles, beating a certain time, or completing the level in one unbroken combo. There are even compound tasks, like completing the level under a certain time limit while hitting every target. Each task completed earns you a star, which are in turn used as currency to unlock additional levels. Some levels will give you a special token if you complete all tasks in a single run, the coveted Special Edition token. Rocketcycle: When a regular motorcycle just isn't dangerous enough. Regardless of you are playing themed levels, multiplayer, or laboratory, or any of the other different spins on levels, the game is fun and well crafted. Plus, the high score mechanic and varied goals will keep you coming back to old levels again and again, first to beat them, then to complete their tasks, then to beat the high scores set by your friends. There is something rewarding about completing a level once with a score of 2,300, then coming back later to replace that score with 26,000,000. As you come closer to completing the career mode, you’ll find your skillful racing and stunt driving earning you avatar rewards, new costumes, and other unlockables. Good work. Not much to say about the sound in this game. I was a tad more interested in getting a few more front flips into the current combo than paying attention to the soundtrack. The general presentation is the sort of “SUNDAY, SUNDAY, SUNDAY!” announcers that we’ve come to expect from monster races, tractor pulls, and stunt shows. So that does the job, I’d say. Joe Danger was once the greatest daredevil in the world, but his ambition and hubris led to a ruinous fall from the top of the sport. Imagine Icarus, except with a rocket-boosted motorcycle instead of wax wings. This game details his climb from the very lowest rung of the stuntcycle ladder to the pinnacle of the sport once again. 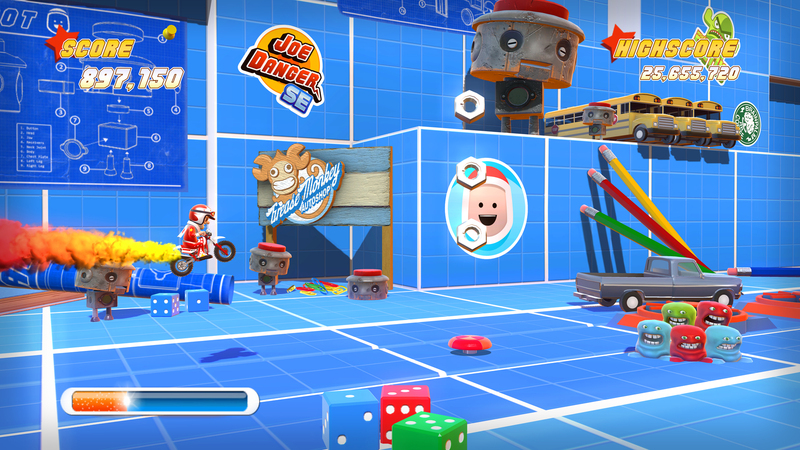 Joe Danger may have elements of a dozen different games, but all of those bits and scraps have been assembled into a unique quilt. It is slick, varied, and downright addictive. I heartily recommend it. 9.1 / 10: A fun and diverse tribute to some of the most entertaining aspects of some of the most entertaining games in memory that somehow manages to be unique. The loop might be fun, but it won’t win you the race, that’s for sure. Rocketcycle: When a regular motorcycle just isn’t dangerous enough.